Apollo and Starbuck learn the secret of Volahd. Commander Adama uses the term "kilon" as a measure of speed through space. This is the first reference to such a unit. On page 7, after Sheba has been removed from their cell to face Volahd, Apollo tells Starbuck, "I don't know how, but I know she is in big trouble." Uh, it's probably because Taron already told them (in "The Law of Volahd" Part 1) that Volahd has judged them all to be evil and "...the sentence for evil is death!" 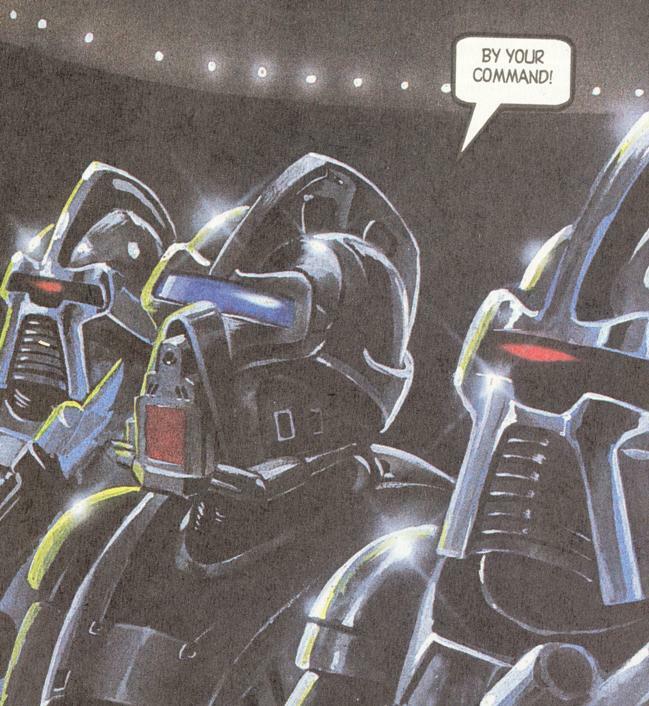 Volahd is revealed to be a Cylon IL-series, communicating to the natives via holographic projection. It is not clear whether "Volahd" is the Cylon's real name or one that is native in origin in order to be more closely associated as a god by them. 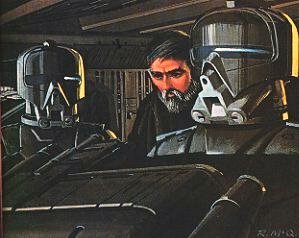 The latter might be the more likely since the IL-series Cylons previously (and since) have all had names with a sinister association on our modern Earth and "Volahd" does not seem to directly reference anything Earthly; however the name might be a sort of bastardized anagram of "devil" (dahvol). Where did Averna get the Acmaran energy staff on page 12, with which she dispatches one of the captors? She did not have one before this and it does not appear as if either of the two Acmaran guards who were carrying the unconscious Sheba had one with them. On page 20, Sheba asks Apollo how they are going to get past the Cylon centurions guarding their Vipers, saying, "We have no weapons!" What happened to the energy staff Averna used on page 12? She's standing right there next to the two humans as they speak! 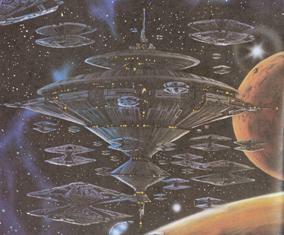 The depictions of Volahd's basestar crashing into the planet while the electrical discharges of the planet's force field crackle beneath it, are similar to the scenes of the Imperious Leader's basestar going down over Carillon in "Deathtrap". Starbuck's "Yeeee-ahh!" 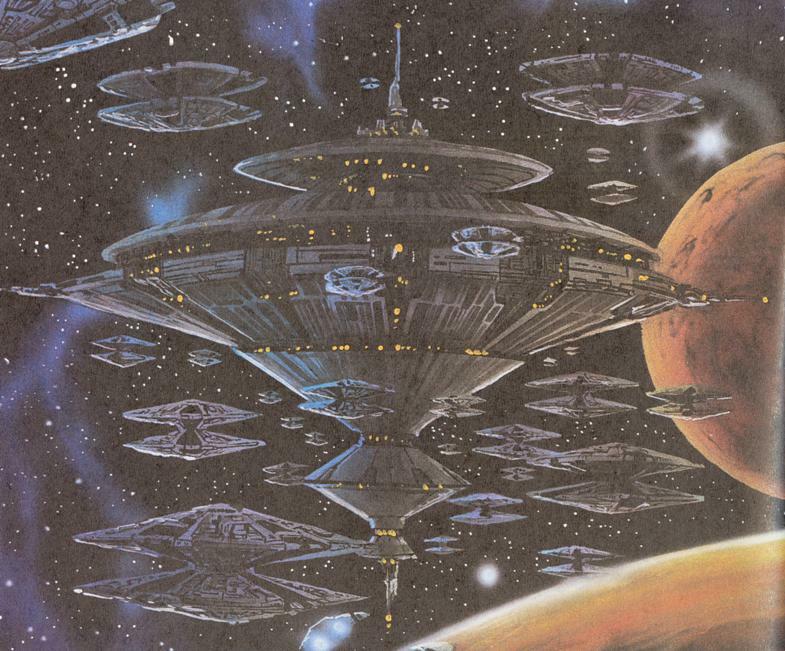 as the four Viper pilots escape the destruction of the city of Salis seems a bit callous considering the city's destruction means the death of thousands of Acmarans, most of whom were merely innocent dupes of Taron and Volahd. For some reason, the shelves behind Commander Adama's desk in his quarters on page 29, panel 5, are empty! They always had books and knick-knacks (including a Viper helmet) on them in the TV episodes. 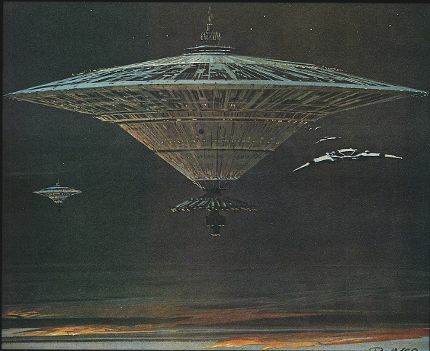 The super-basestar on page 30 and the depiction of elite Cylon Vulpa Six on page 31 both appear to be modified versions of early BSG production paintings by Ralph McQuarrie. Notice that Vulpa Six has a blue-lighted vision aperture. 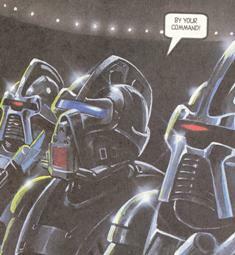 What was the purpose of the Cylon experimentation on Acmarans, much of which seems to have involved added cybernetic enhancements to the Acmarans biological bodies? Were they to become a new type of centurion? Is there any association/relation between Vulpa Six and the gold Command Centurion called Vulpa who appeared in "The Gun on Ice Planet Zero" parts 1 and 2?